The capital city of Serbia, and the greatest metropolis of the entire Balkans. As a dark tourism destination it offers a pretty unique combination of recent war scars and propagandistic military exhibitions with some remaining Tito cult-of-personality thrown in, as well as a couple of WWII-/Holocaust-related sites. 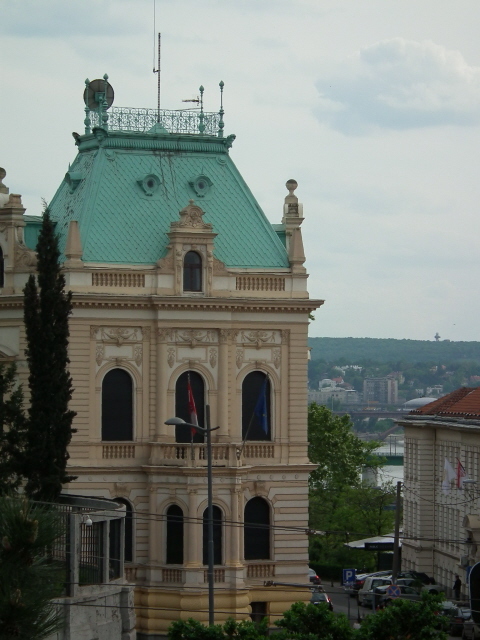 More background info: Belgrade (or "Beograd" in Serbian) is one of Europe's great capital cities – and even though it can't quite compete with the likes of Paris for sheer grandeur and size, it is still not far off closer competitors such as Budapest. In its history it was battered about by the Ottomans as well as the Austro-Hungarian empires, and changed hands between those powers a few times. This cross-roads position, on the other hand, ensured its strategic importance and so it was fortified and grew in size too. 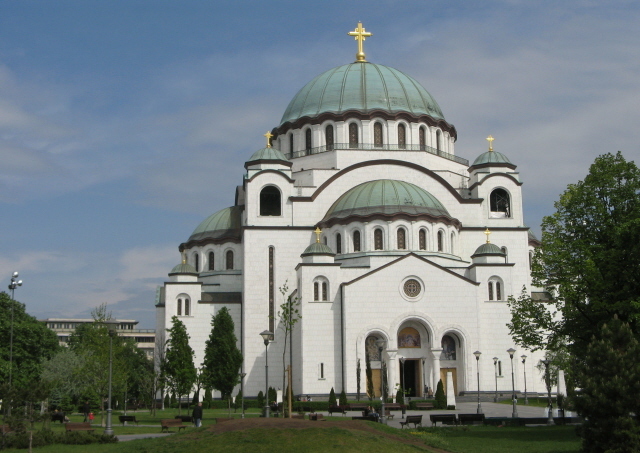 It became the capital of Serbia in the mid-19th century, and that of socialist Yugoslavia at the end of WWII in 1945, after a period of occupation by Nazi Germany. The latter was ended by partisan leader Tito, who managed the remarkable feat of keeping united the various peoples of Yugoslavia for 35 years, and for a while even beyond his death in 1980. 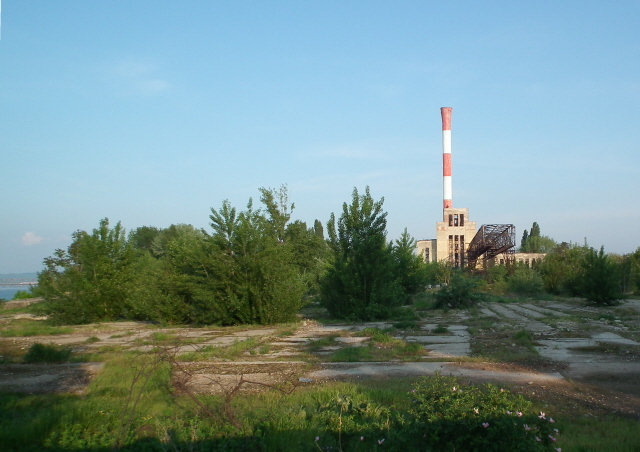 But with the subsequent break-up of the Yugoslav federation from the early 1990s onwards (in the wake of the collapse of the surrounding Eastern Bloc), Belgrade's status and sphere of influence became more volatile. Still it clung on to being the capital of the diminishing rump Yugoslavia, then "Serbia and Montenegro", until the latter too decided to go it alone in 2006. Since then Belgrade has been the capital of independent Serbia. As the capital of all the various Yugoslav and Serbian incarnations it has also always been the hub of power, from Tito, via Milsosevic, to today's more EU-looking governments. For the dark tourist this history left a few outstanding sites, covering the horrors of WWII and the Holocaust, the cult of personality revolving around Tito, and the NATO bombings intended to bring then leader Slobodan Milosevic to heel. The fairly recent war scars from the 1999 conflict are thus almost unique within Europe (although there are also plenty in Bosnia & Herzegovina, but not quite on the same scale size-wise as far as the respective buildings are concerned… and the even more recent ones in eastern Ukraine are of course still in a war zone and thus totally off the tourist track). What there is to see: Of all the Balkan capital cities, Belgrade has probably the widest range of dark tourism sites, both by number and also by breadth of types covered, from more or less abstract monuments, via museums, to very concrete recent war damage. The following are all granted separate entries. In addition, there are a few monuments that may also be of interest to many dark tourists. First and foremost there is the Monument to the Unknown Hero on Avala hill, a colossal memorial to the fallen soldiers of World War One and the preceding Balkan wars, together marked by the dates 1912-1918. 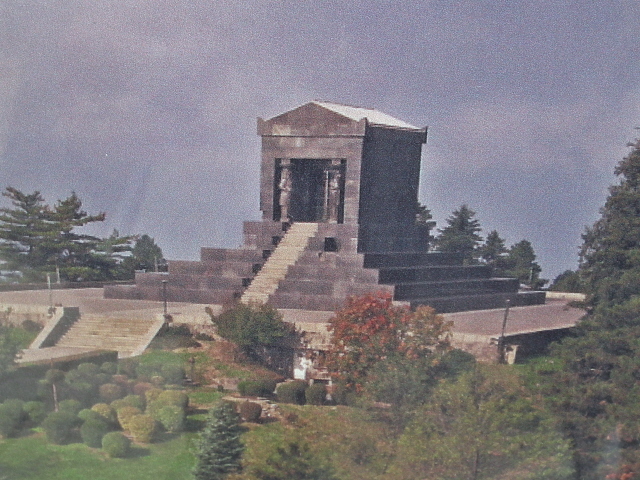 The monument itself, which resembles a rectangular classic mausoleum, is primarily made from black marble. 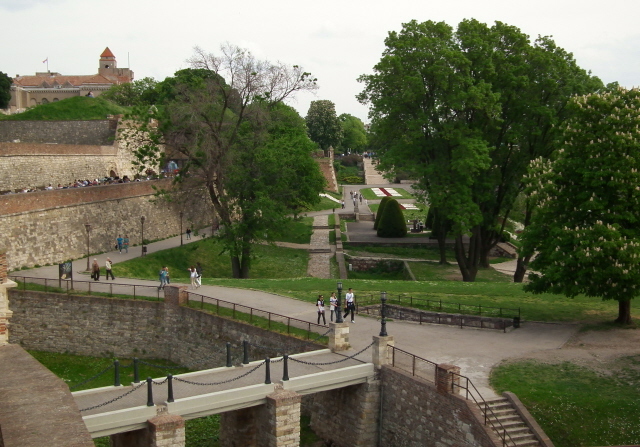 Monumental steps lead up to the hilltop location. To get there follow the directions under NATO bombing scars to the Avala TV tower, which is just a few hundred yards to the north of the monument and reached by the same bus. Of Belgrade's many other monuments, one is of special note here: the Holocaust monument by the Danube river promenade north of the city centre. 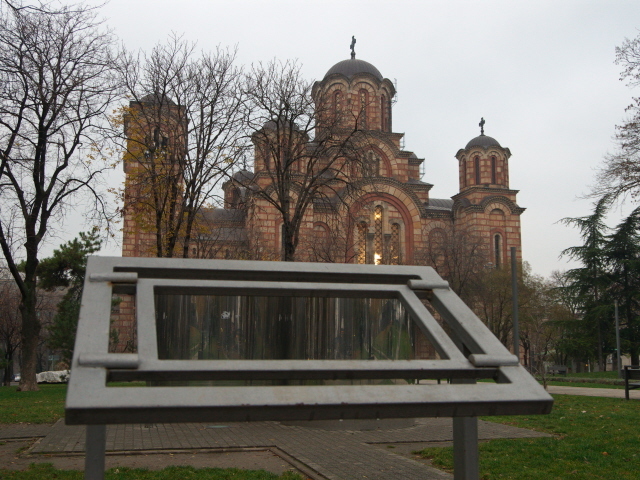 Erected only in 1990, the monument is dedicated "to Jewish Victims of Nazi Genocide in Belgrade and Serbia 1941-1944", as a small trilingual plaque at the bottom specifies. The shape of the monument-sculpture itself is somewhat reminiscent of the central sculpture at Dachau, with interconnected human shapes, that look like they're being blown about by a tornado. At the Memorial Park Jajinci in the south of Belgrade, ca. 3 miles (5 km) north of Avala hilltop, there are yet more monuments, and even a bilingual plaque, to mark the main site used by the Nazis during WWII as an execution ground and for mass graves (including for the gassed Holocaust victims of the Sajmiste camp). Related to this topically and thus another place of interest to the dark tourist could be the Jewish Historical Museum in Belgrade city centre at 71a Kralja Petra street (first floor). However, it has extremely short opening hours: Monday to Friday 10 a.m. to 12 noon – which is why I didn't make it there myself and thus can't report back first hand. Another museum can be mentioned here, the Nikola Tesla Museum (51 Krunska street, opening times: Tuesday to Friday 10 a.m. to 6 p.m., weekends 10 a.m. to 1 p.m.; admission 300 RSD). It's generally more for technology and physics buffs, but may also be of passing interest to some dark tourists, a) given the wide-ranging implications Tesla's inventions have had in the modern world, not all of which are 100% positive (think of the reliance on radio technology in war and propaganda, or imagine an electric chair without high voltage transformers …), and b) the museum also has on display the urn with the ashes of Tesla himself! When wandering about the old town south-west of the city centre and the fortress one can happen upon an empty lot between the buildings on a corner of Kosancicev Venac street. The lot is not quite empty, though. 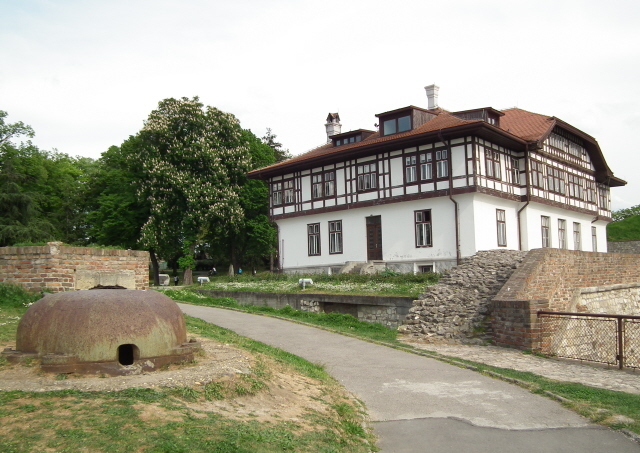 You can see ruins of foundations and brick cellars. This is the spot where the old National Library stood until it was bombed and burned to the ground by the Germans in 1941 during the early stages of the occupation of Serbia by the axis powers. A large text panel points the tragic loss of cultural heritage out in poetic words, in English, and urges passers-by to stop for a moment's reflection (with perhaps just a little too much pathos). Those who like exploring cemeteries can do so in Belgrade's New Cemetery out to the east of the centre. To get there take either tram line No. 12 (from the main railway station or Slavija square), which goes past the main entrance directly, or take (trolley) bus line 40, get out near the intersection of Cvijiceva and Ruzveltova and walk up the latter. There are a few grander tombs and some pretty unusual headstones. I particularly liked one in the form a raised fist – defiantly revolutionary beyond death! Furthermore there are several memorials, in particular to WW1. Right in the back there is a (fenced-off) section with a monument and semi-overgrown graves of Austrian and Hungarian fallen soldiers of 1914-18. Opposite the main entrance to the cemetery is a grand socialist realist monument to the liberation of Belgrade in 1944, complete with bas reliefs and statues of fierce soldiers. Parallel to the park behind it is a Jewish cemetery. Finally, for some dark tourists it may also be a kind of twisted treat to see the Socialist-era brutalist architecture which is especially prevalent in Novi Beograd (New Belgrade), the modern part of the city stretching out westwards on the flat plain left of the Sava river. 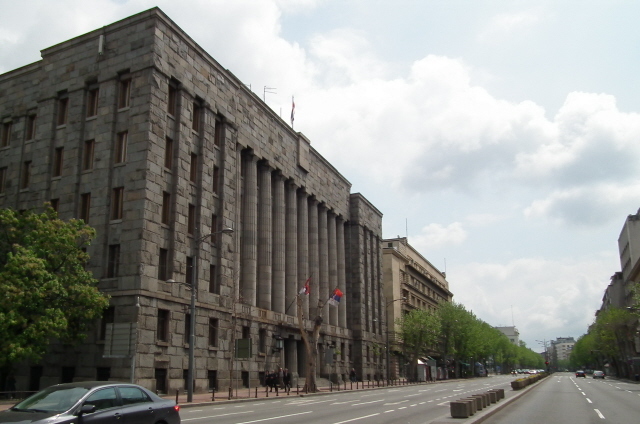 The so-called Palace of Serbia is a particularly stunning edifice: built from 1948 to house the Yugoslav government, and still housing several ministries of the Serbian government today, it is absolutely huge, in fact the largest building in the country by area (though not at all by height – it's rather low). The H-shaped structure has a distinctive socialist architectural style and the expansive plaza in front of it only underscores the sheer size of the site. When walking there, though, beware of the packs of vicious dogs roaming the plaza! 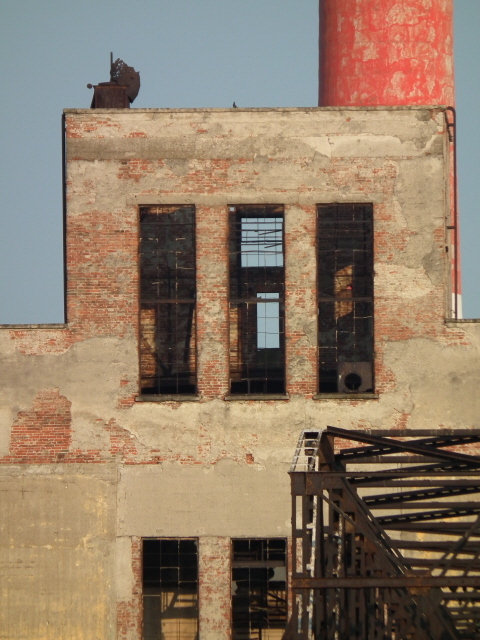 Another notable building – and one to be seen from far away, is the Genex Tower. This landmark of modern Belgrade is actually a tower complex, consisting of two central round concrete towers, one of which is crowned by a circular revolving restaurant at the top (currently closed), the actual twin office tower blocks are directly attached. 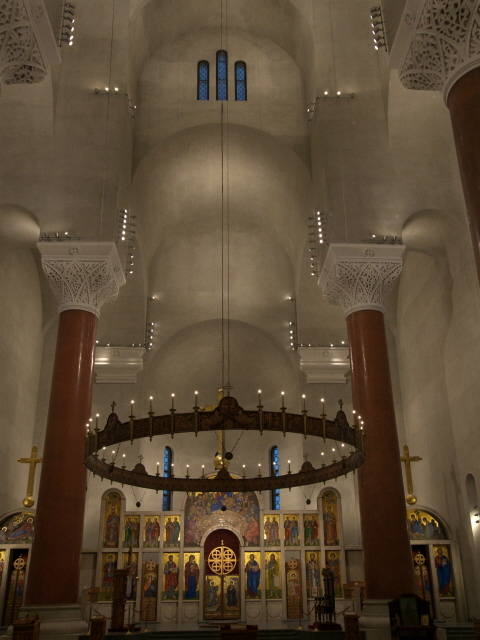 The two parts are connected by a "sky bridge" at the top, thus vaguely forming the shape of a "gate". The edifice will not win any awards for beauty, but it is surely an interesting design. Much more so than the tall but boring Usce Tower nearer the city centre. This tower, on the other hand, used to be of extra dark interest, because it was one of those Belgrade targets that was repeatedly bombed by NATO in 1999 (it housed Milosevic's Socialist Party's HQ). However, the building has been completely reconstructed and at the foot of the tower is now a flashy modern shopping mall. Much of the rest of Novi Beograd consists of endless typical blocks of pre-fab residential blocks oozing the usual depressing drabness familiar from many such socialist housing areas. Here it is particularly amassed and thus also a dark sight of sorts. 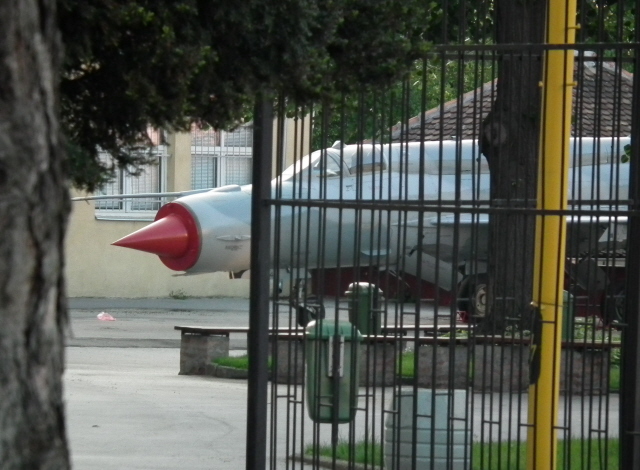 You can view it in its full drabness from the bus going to the airport (and the Aviation Museum). Hidden in a south-eastern corner of Novi Beograd, Block 45, at the corner of Jurija Gagarina and Dr. Ivana Ribara, a rather dodgy (and grotty) little bar can be found (Luda Kuća – abbreviated L.K.) 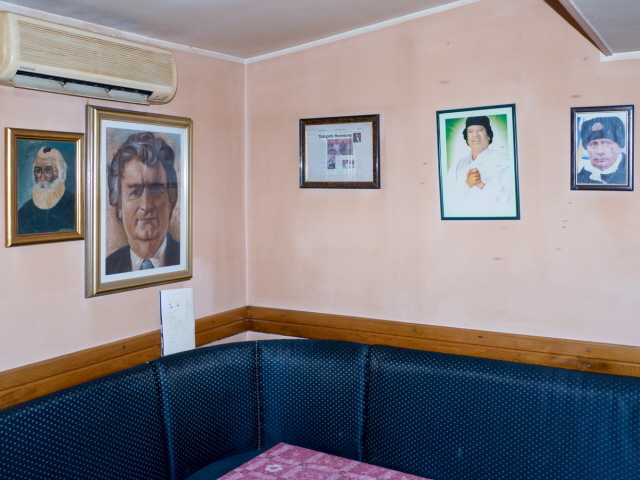 that abandons itself to a degree of cult of personality of the bad old boys of Serbia, Karadžić, Mladić and Milosović, whose portraits adorn the walls of the small room inside. 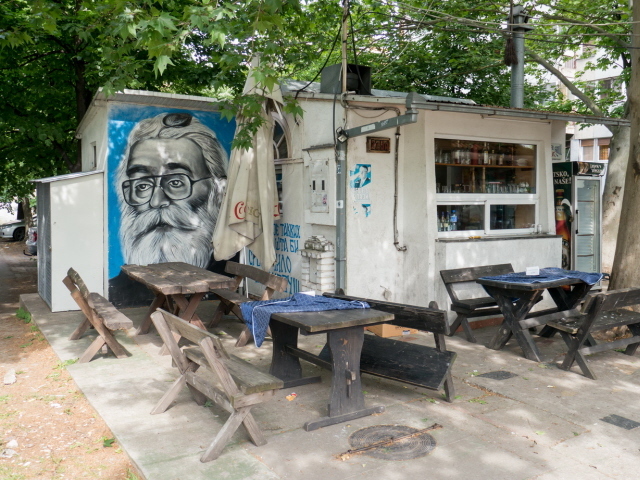 Outside there is a larger-than-life mural of Karadžić with the beard he had when he was posing as a doctor/spiritual healer before he was captured in 2008. 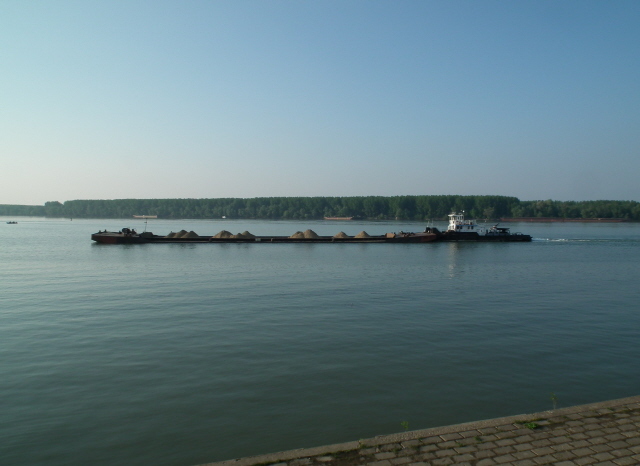 Location: In the centre of the northern half of Serbia, on the Danube river, ca. 200 miles (330 km) south of Budapest, Hungary, and about the same distance from Sofia, Bulgaria, to the south-east. Access and costs: quite easy, still not too expensive. Details: Belgrade is easily reached by virtually any mode of transport: from further afield, the capital city's international airport (and air traffic hub for all of Serbia) is bound to be the first choice for most travellers. 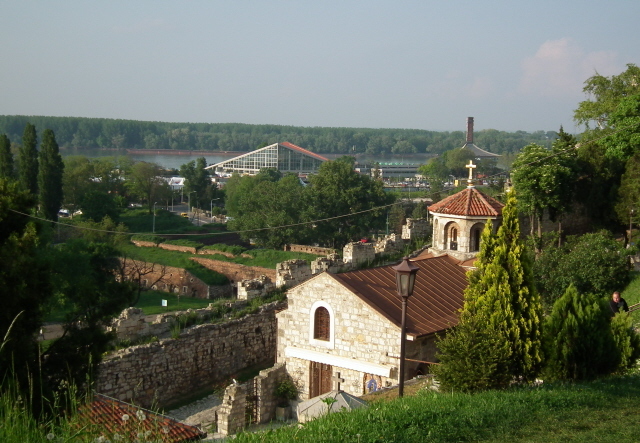 Some air fares to Belgrade are also quite affordable. But getting there by train is also a perfectly viable option. There are very convenient (and if booked early: cheap) overnight trains from/to Vienna, for instance. Budapest is en route and thus also a good departure point for coming by rail. Further capital cities within easy train journey reach include Sofia (Bulgaria), Zagreb (Croatia), and Skopje (Macedonia, via Nis), while the connection to Podgorica (Montenegro) is rather slow, but said to be very scenic. Obviously, there are also plenty of international bus connections from countless departure points all over Europe. 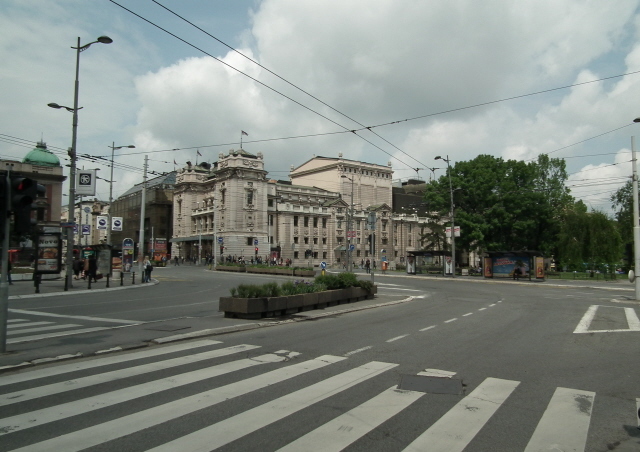 Getting around Belgrade is helped by a fairly easy to use public transport network. Belgrade lacks a metro system, but trams, buses, and (so typically Eastern!) trolley buses do their job well enough. There are only single-ride tickets for any of them, even though operated by different companies. One ride costs (in May 2011) a flat fare of 50 dinars if bought in advance from any kiosk, which are dotted all over the place (and sell everything from newspapers to beer and convenience toiletries). Tickets can also be bought on board in an emergency, but cost double that way. Tickets have to be validated on board: there are little yellow slot machines for that – don't wait for the ticket to be stamped automatically (all tourists seem to expect that at first, me too), you have to manually pull the lever down to punch the ticket. UPDATE 2015: this has changed; they now have electronic tickets that you have to hold against an electronic reader machine as you board the bus. Prices have also gone up a bit. All-day tickets are a good deal, even if you only do four journeys or so. The inner city is walkable enough, and some of the sights mentioned here won't require public transport – other, however, most definitely do, such as the Aviation Museum or the Tito mausoleum & museum complex. The range of accommodation options is as wide as befits a capital city of Belgrade's status, from budget to top-end. I don't normally single any particular place out, but here I would like to make an exception, not just because I was happy with the level of service in that place, but because it potentially offers something special for the dark tourist: The "Mr President Hotel" near the main central train/bus station is named so because each room has the portrait of one of 57 world leaders, alive and dead, past and present. If you are unlucky you may only get someone like Margaret Thatcher or Silvio Berlusconi (I don't think I could sleep with him looking on! ), but there are also dark-tourism-relevant names amongst the lot available, such as: Ex-PLO head Yasser Arafat (Room No. 704), Cuba's Fidel Castro (502), Romania's Nicolae Ceausescu (209), or even Josef Stalin (211, which is a smoking room, obviously). Some big shots are allocated to suites, including Lenin (206) and Mao (406). The top-end option, the penthouse suite, is adorned with, predictably perhaps, Yugoslavia's own big man of yesteryear: Tito (701). As far as food & drink are concerned, Belgrade is not much different to the rest of the Balkans, which means meat is firmly dominant, especially the ubiquitous cevapcici, but vegetarians can get by with starters/salads/sides. Otherwise, there's always pizza ... the veggie's life-safer in so many a carnivorous country. Foreign cuisines do exist but are still not as widespread as in Western cities. Craving a curry, my wife and I followed a tip for a good Indian restaurant, but it was an odyssey to get there ... the taxi driver had to ask for the way five times – and even phoning the place didn't help much! The curry, though, was alright ... and the wine excellent! Note that Belgrade, like the whole of Serbia, is still stuck in the olden days where everybody smokes everywhere. Only a few of the more touristy restaurants may have non-smoking sections, but often these are right next to the haze-filled main part so that it gets smoky even in those alleged smoke-free sections. If Serbia is really aiming to join the EU, this will presumably have to change. Or maybe the country will follow its big buddy Russia's example of 2014 and just introduce a smoking ban in public places without such a prompt. For now, however, it seems unlikely. Time required: to see all the dark sites, a few days will be necessary, depending on your sightseeing speed a minimum of two full days (on an extremely tight itinerary), but better three or four, if not more, if you also want to appreciate the city as such properly. Combinations with other dark destinations: see Serbia. Combinations with non-dark destinations: Belgrade is also a very worthwhile travel destination for numerous non-dark reasons. The cityscape may not be all sandblasted clean everywhere as is the case in many of the great cities in the West. But you can still see that there's a lot of almost Parisian grand turn-of-the-century architecture about, if sometimes a bit grey or blackened from age and smog. Other, especially representational buildings have been spruced up to full shiny glory too, e.g. the cathedral-like House of Commons (parliament) building opposite Pionirski Park, while the Old and New Palace in the park still remain grey. 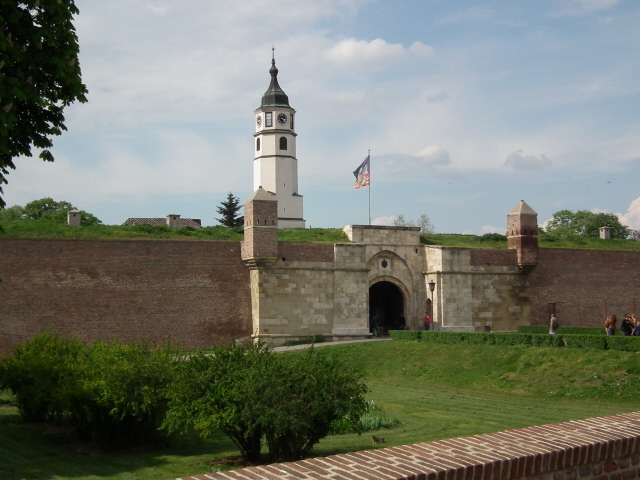 The crown jewel of all tourist attractions of Belgrade is the Kalemegdan Fortress and Park. It is indeed a splendid place where you can while away a lot of time just ambling around taking in the views. 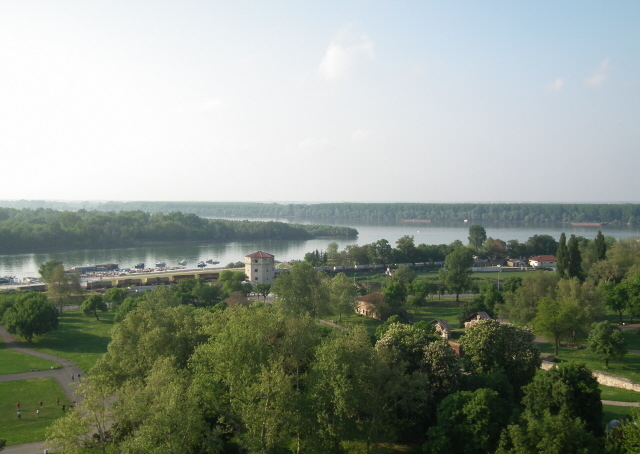 From the front, at the top of the hill, you get a fantastic view of the confluence of the Danube and Sava rivers. 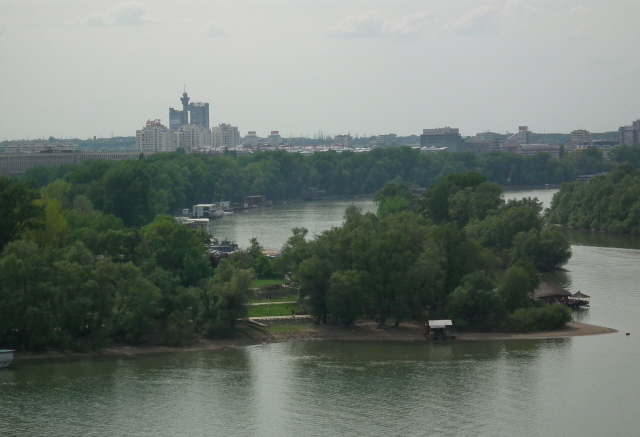 Walking along the riverfront is also a popular past time in Belgrade, for locals mainly, but also tourists. Other "proper" touristy sights include the pedestrianized street of Knez Mihailova that leads from the central Republic Square right up to the edge of the Kalemegdan Fortress park. Yet another popular street is Skadarska street north of Republic Square, with many restaurants and bars. One hub of Belgrade's much-famed nightlife is said to be round the corner, on and around Strahinjica Street (also called "Silicon Valley", not for any high-brow IT nerds but rather the peroxide blonde trophy girls of the local macho scene). 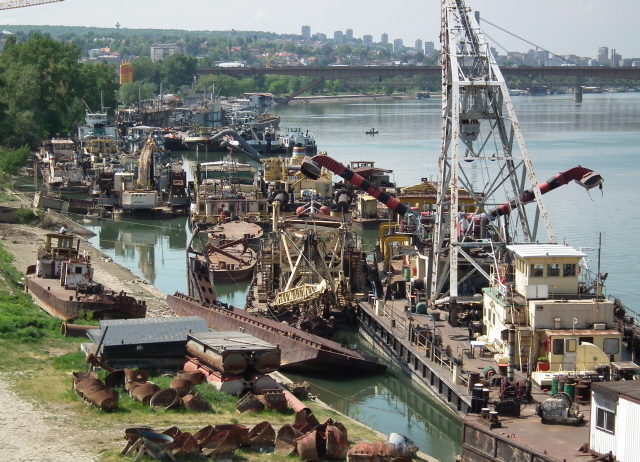 A lot of the "action" is also going on at floating venues on the river banks of the Sava. I did not sample any of this myself – nor did I get the impression there would have been much of a chance, because the time of my visit coincided with May Day, followed by a long weekend of public holidays so that the city seemed much more deserted than it presumably is normally.